This is our basic how to grill with propane guide. It is designed for those who have just purchased their first grill and are looking for a place to begin. Grilling with propane is as easy as grilling gets. Yet, if you are new to grilling it seems complicated. 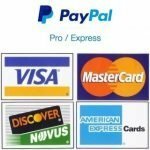 So here are a few helpful tips and commonly asked questions to help you get started. 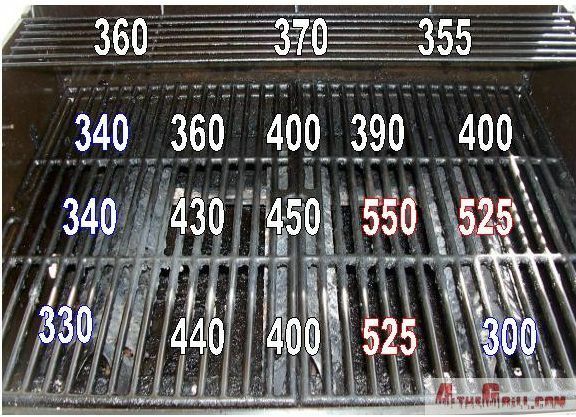 Every grill has different temperature zones. These vary with heat settings, venting, burner types and the basic shell of the grill has an influence as well. Below you will find an example of the temperature zones on my gas grill. It has three burners that run vertically with heat diffusers on top of them. With all burners on high the temperatures range from 300 to 550 degrees. That’s a big variation. Especially when you consider the spots are only a inches away from each other. This is why nobody can give you exact cooking times on any foods. A grill is not like an oven that maintains a constant and even temperatures throughout. Upper rack temperatures range from 355 to 370 degrees again, quite a variation. Especially when you consider it’s only about 8 inches off the lower rack. 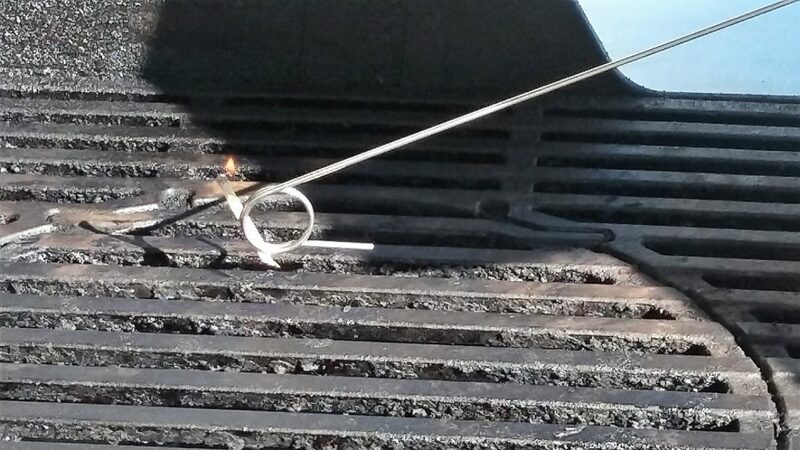 With most of the things we cook on the grill temperature control is key. As long as your gas grill has at least two gas control knobs you can control the temperature easily. It may not be as exact as an oven you can get pretty close. Simply by turning the knobs and adjusting and placement of your food on the grill grates you can have complete control over your temperature. I will refer you back to the heat zone chart of my personal grill. With three separate burners and three separate gas control knobs I can achieve a wide variety of temperatures. Simply by turning burners on or off or on high or low then placing the food directly above the heat off to the side. I can cook things anywhere from 200 to 500° at a constant temperature. Example: If I want to cook something at 200°. I simply place the food to the far left and have only the right side burner on low. If I want to cook something at around 400° I have the center burner on about three quarters of the way and the other two burners off. There is a learning curve to this; You can use some of the wide variety of thermometers available to get your cooking more accurate quickly. You can use something as basic as a surface thermometer with a dial or as high tech as an Digital Laser Infrared Thermometer. Whichever method you choose will pay off for you in the long run. You lose a lot of heat every time you open the hood of your grill. In the next paragraph are a sample from the temperature drops on my grill over a five-minute period of time with the lid opened. This test was done with an infrared temperature gun. 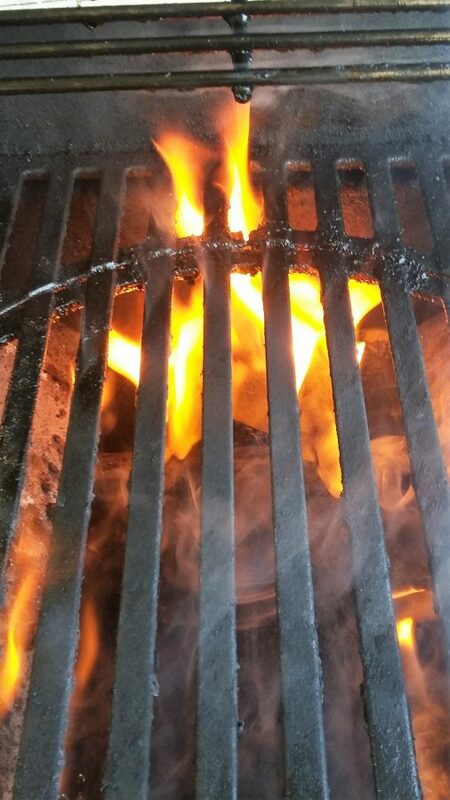 The temperature on the lid of the grill, said it was 350°. While that may have been close to what was on the upper rack. It was off by almost 200° on the lower rack temperature. Always keep that in mind when trying to keep a constant temperature keep the lid closed. 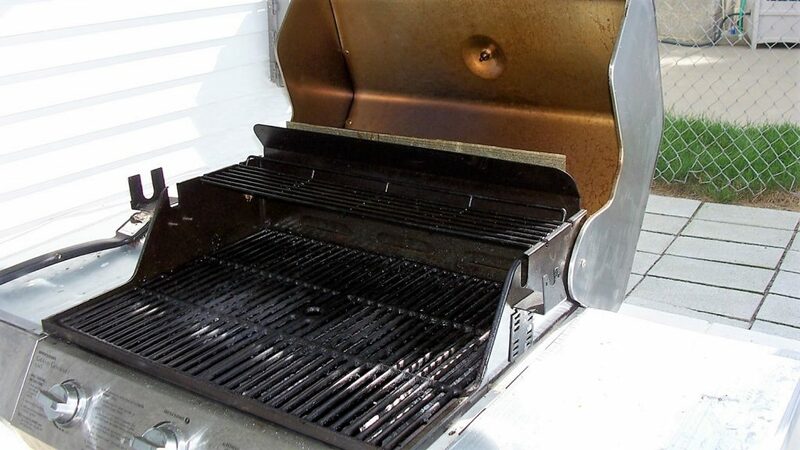 A grill with an internal temperature of 530° with the hood open 30 seconds is 450°. After a 1 minute, 340°. Lid open 2 minutes, 300° Lid open 5 minutes 250°. Now you can see how much heat you lose. It’s very hard to get consistent cooking with the temperature is going up and down all the time. 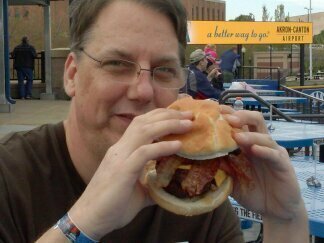 It depends on the size of your grill and how you cook. We have an entire post about this here. Here are a couple of excerpts from that post that should help. I have found that a propane tank lasts longer in the summer months than during our cold winters. Cut approximately 20% off of the life expectancy of your propane if you grill during frigid weather. This could be due to contraction of the gas in the cold or just because you need to cook at higher temperatures. 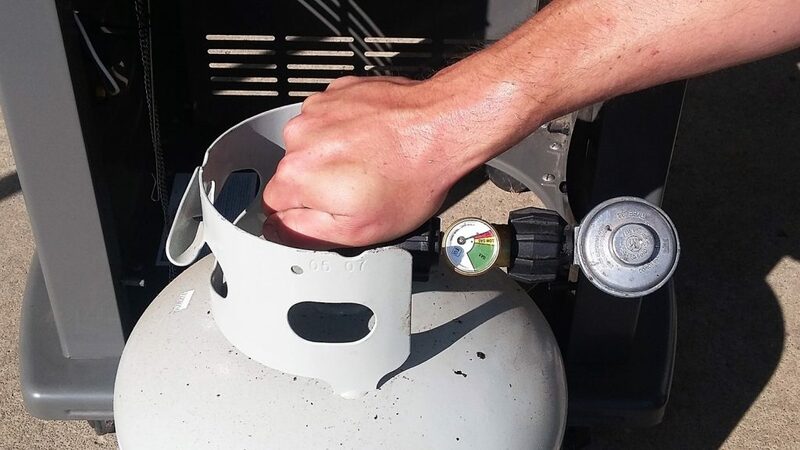 How to Grill with Propane: How do I tell if my propane tank is low? This is another subject we have an entire post about here. If you do not have one of the many gadgets available to measure how much gas you have left, here are a few tricks. The most accurate way is to weigh the tank, the empty tank weight is stamped on the top ring near the handles. Typically a 20 pound propane tank it is around 17 to 18 pounds. First disconnect the hose then set the tank on a bathroom scale. Subtract the empty weight of the tank and what is left is the pound(s) of propane you have left. Or Shake the Tank. Propane is a liquid so you can hear it sloshing around inside the tank. Disconnect the hose first.